(Jeremy Harmon | The Salt Lake Tribune) Brigham Young Cougars quarterback Zach Wilson (11) helms his team as BYU faces the Western Michigan Broncos in the Famous Idaho Potato Bowl in Boise, Idaho, on Friday, Dec. 21, 2018. It’s an annual question that has been asked every year since BYU went independent in football in 2011. Is the Cougars’ schedule — especially in September — too difficult? Athletic director Tom Holmoe says it very well could be, but that’s the hand the Cougars have been dealt. It is better to roll up their sleeves and prepare for it than to sit around and complain, he said. BYU released its 2019 schedule on Wednesday, and it includes the opener against Utah, followed by a road trip to Tennessee, then home games against USC and Washington. The Cougars will also host Boise State, Liberty and Idaho State and play at Toledo, South Florida, UMass and San Diego State. They will do well to go 6-6 again, although I’ve got a feeling that won’t be acceptable in Provo for a second-straight year. 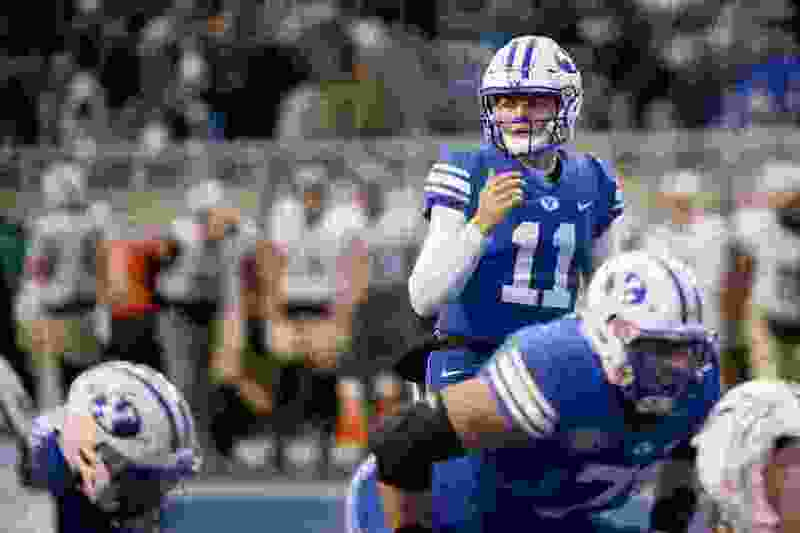 Holmoe said BYU’s season ticket sales “are up from last year, at this point,” and the Cougars have already surpassed last year’s sales totals. “I think it is a good sign,” he said. Obviously, the schedule would look a lot different — in terms of when they played specific opponents on the calendar — if Holmoe had his druthers. He wouldn’t start with four Power 5 opponents (the only school in the country doing that) for starters, instead spreading out the more difficult games if he could. • BYU’s softball team, the five-time defending WCC champions, have been picked to win the league again in a poll of the league’s coaches. The Cougars, who went 37-22 last year, 13-1 in the WCC, return five starters from a squad that made its 14th straight NCAA Tournament appearance in 2018. BYU received four first-place votes, while LMU received two. • Having garnered its first national ranking, No. 25, since 2012, the BYU women’s basketball team travels to LMU on Thursday and Pepperdine on Saturday for big WCC road games. The Cougars downed San Diego 65-56 at San Diego last Saturday to improve to 17-3 overall, 9-0 in WCC play. • The No. 3-ranked BYU men’s volleyball team (4-0) didn’t play last week. The Cougars play at No. 9 UC Santa Barbara (7-3) on Friday and Saturday in Robertson Gymnasium. The Cougars are 42-22 all-time against the Gauchos. • BYU golfer Carson Lundell fired a 5-under 208 to finish 16th at the Arizona Invitational earlier this week. The Cougars shot 8-under as a team to finish in ninth place out of 16 teams.